Part of the Stained Glass Sundials by Carmichael Flickrset, which is part of the larger Sundials by Carmichael's photostream, by Arizona Sundial Creator John Carmichael. Make sure to check out Carmichael's Stained Glass Sundials website. 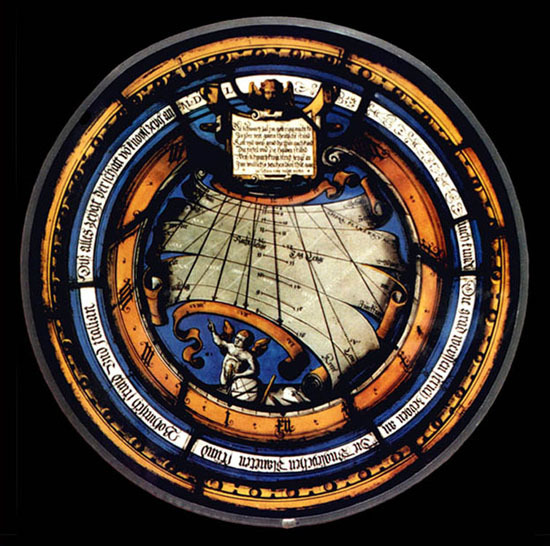 It includes an incredibly rich archive of historical stained glass sundials. The annotations are copious and well organized. For example, this is the The Ambras Castle Dial, a Swabian sundial made in 1550, from the page for the 16th and 17th century stained glass sundials. Another stained glass site worth a good long browse.. or two.